These economical lightweight event photo folders can be used as is or personalize them with your event name, date and logo for a memorable keepsake. Lightweight 4" x 6" Cardboard Photo Folders from Get Smart Products offer a cheap and inexpensive way to add a frame to photos that are printed during an event. The folding frames protect the photo during transport and give recipients a quick way to display the picture. The cardboard frames are available in your choice of black or white and have a smooth finish. Frames can be used to hold one horizontal or one vertical 4" x 6" photograph or print. Ideal for a variety of events, these frames can be used for photo favors, fundraiser items, special promotions, trade shows giveaways and more. The frame design includes a large, blank cover that can be embellished with a logo, monogram or emblem. 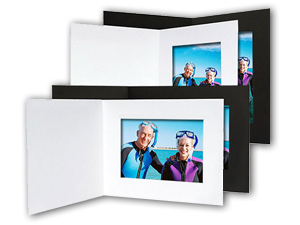 Our Standard Event Photo Folders offer convenient side-load construction. They are sold in packages of 25 and bulk pricing is available so you can save more when you order more. Envelopes are available separately and custom imprinting is also available at an additional charge. These photo frames are made in the U.S. using recycled materials. When folded, the photo frames measure 6" x 8".